Wesley Yu appeared on Show 273, recorded in June 2013, at age 16. 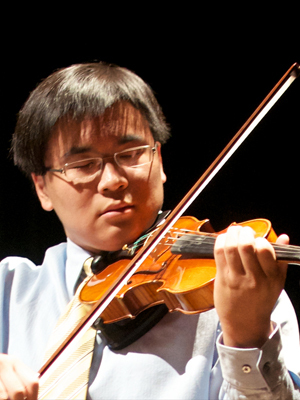 Wesley Yu (violin), 16, is from El Paso, Texas where he is a student at Coronado High School. He studies music with his father, Hanson Yu. Wesley is a member in the Coronado High School Varsity Choir is also the accompanist for the other school choirs. In 2010, he was the Grand Prize winner of El Paso Summer Music FestivalÕs Young MusicianÕs Competition and is also an outreach performer for the festival. Wesley loves cars and machines and enjoys going for a drive in his spare time.